How Do You Remember The Classical Techniques? Website Features: Hokkaido 2020 ~ our dream to open up a Nihon Goshin Aikido Dojo in Chistose by 2020. Vintage Pictures of Kuma Station ~ the Army base Shihan Bowe was stationed at when he was in Japan. April is here, and all of March’s deadlines have thankfully passed. My strategy sessions with my accountant have paid dividends, and my “total tax” is much less than it has been in over 15 years even though my revenue is higher. The easiest pay raise one can accrue is when one does what he did last year, and pays less taxes. It pays to be proactive. Cha-ching! 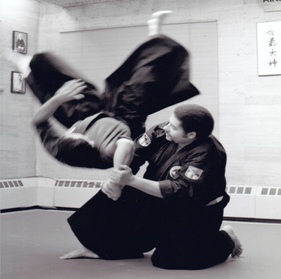 Review any self defense curriculum, and you will see many Nihon Goshin Aikido staples such as the Arm Bar, the Mugger’s Throw, Shoulder Throw, etc. These techniques transcend style, and simply exist on their own merits. Watch an old Star Trek episode, and odds are good that Captain Kirk will execute a perfectly acceptable Groin Block application if he is fighting an alien for possession of a weapon. With that back drop, I have been thinking about the Whip Throw and its origins. Last month I sent out a few emails to senior students in our art and asked them their opinions on Whip Throw technique, and if they had any ideas about its roots, origin, etc. The information I received back from these students was very consistent in that they all stated that after the initial "whip lash effect" the projection will be down, and not out, in a street application ~ causing uke to land on his head. 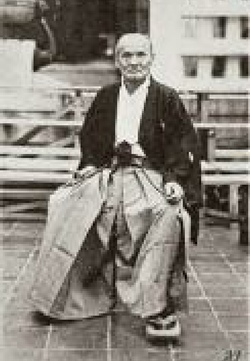 When asked about the technique's origins, I was pointed to a couple of different places: perhaps Yonkyo (Aikikai) which controls uke higher up on the forearm, activates a nerve pressure point, and generally results in a pin. 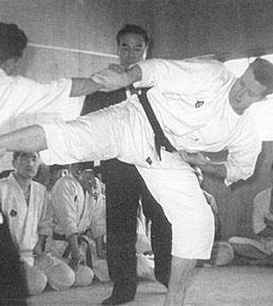 Another possibly mentioned was a 2nd Scroll technique in Daityo Ryu that attacks the wrist at the same point, but projects uke out at a different angle (a 45 degree angle) across nage's body. Since there were no “perfect matches” in other arts, I began to speculate that the Whip Throw might very well have been a technique that Master Morita customized, modified, or even potentially invented himself ~ making the Whip Throw particularly unique to his style. In my mind, this possibility might explain “why” you don't see it represented in other arts (exactly the way we do it). ~ Think of the “wrist-twisting” motion and compare it to the motion of your hands as you secure uke’s wrist in both your hands on the Whip Throw. This is the same position as the apex of the shomen-uchi cut ~ when the blade is straight above your head. At this point your hands will be centered between your patches, and you are controlling uke's wrist in both your hands using the same "wringing out of a cloth" movement. From here continue your cut by extending your arms outward while maintaining the grip on your imaginary tsuka (handle), and you will finish in the exact same position as you would if you were finishing the Classical Whip Throw Technique. It’s is a spot on match! So, with a literal swipe of the katana, the case on the origins of the Whip Throw is closed. Sword Play! The Whip Throw traces its lineage straight out of sword play! Thanks to everyone who helped me in my search for the origins of the Whip Throw; especially Shihan Bowe. 2. Mnemonic Aids: How Do You Remember Your Classical Techniques? 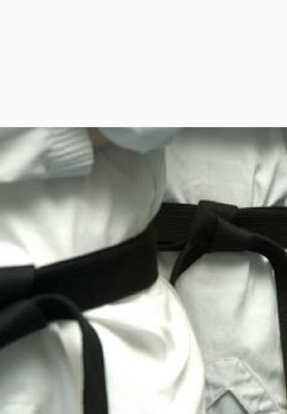 Yesterday evening, while reviewing applications with a student who will soon be testing for Green belt, I was once again struck by the simple truth that a portion of the test for rank is simply remembering the techniques you’re being tested on. It was clear this student knew all of them, but he struggled to name them quickly. We’ve all been there haven’t we? As I think back to my salad days as a new aikido student getting ready to test for yellow belt, I remember thinking about how I initially struggled to find a method to “remember” my techniques. 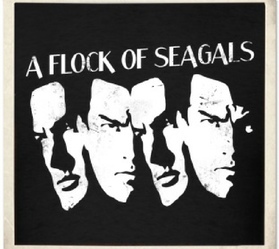 It was my sempai Tim, who suggested arranging the first letters in each technique to spell words. 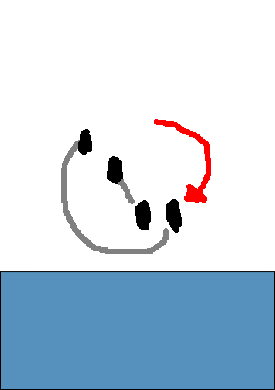 On the Second set, there is only one technique that begins with a vowel; so spelling words is difficult. On this set, I made a sentence instead. Nota Bena: For the record, my particular fascination with smooching registered pharmacists is limited to my soul mate ~ the beautiful red-headed pharmacist I’ve been married to for 24 wonderful years. If I ever struggle to remember techniques in a set, for some reason, it is typically the techniques that comprise the 3rd set. Now this set is the beginning of the home stretch. So those are my memory aids. I know that to be most effective, memory aids need to be personal. Just out of curiosity, what memory aids do you use? 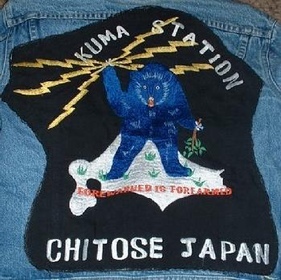 We’ve got a whole section on the website featuring pictures of Kuma Station, the Army base Shihan Bowe was stationed at in Chitose, Japan? I found a cache of photos on the internet which were taken during the same period of time that Shihan was stationed there. I find these pictures compelling. Click here. We plan to go back to Chitose one day! Read my vision statement called, “Hokkaido 2020” ~ a dream to establish a Nihon Goshin Aikido dojo in Hokkaido by 2020. Click Here. C. Edgewater, NJ (Every Saturday) Time is from 1:00 - 2:30 & 2:30 - 4:00 pm beginning this Saturday. Sensei Jose Garrido will be teaching Daitō-ryu Aikijujutsu at the UFC gym in Edgewater, NJ. Cost is only $20 per class o $30 for both, but you must let Sensei Garrido know you are coming at least one day in advance. I think this is a special opportunity. I always talk about the importance of gaining a better understanding of our art and its roots. Sensei Garrido is uniquely positioned to bridge Daitō-ryu and Nihon Goshin Aikido for those Nihon Goshin Aikido brown and black belts who might have an interest in exploring their martial history. Click Here for more information, and to register.